Mitali and Mahesh are Toronto natives who wanted to bring their city and it’s notorious winters into their photoshoot. We planned their photoshoot in the bitter month of February at the Toronto Islands. Although snow was nowhere to be seen, the scenery was breathtaking. 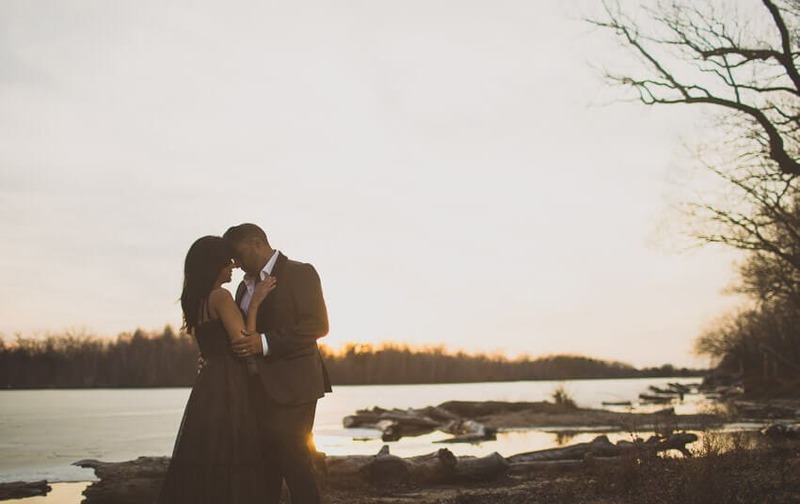 We especially loved the contrast of this wondrous barren land and cold skyline against the warmth of the couple showing their love and affection for one another. The Toronto Islands are a beautiful string of islands with a view of Lake Ontario on one side, and the city skyline on the other. For couples that enjoy a bit of both worlds – this is your location! A fifteen minute ferry ride and you are transported for cityscape. 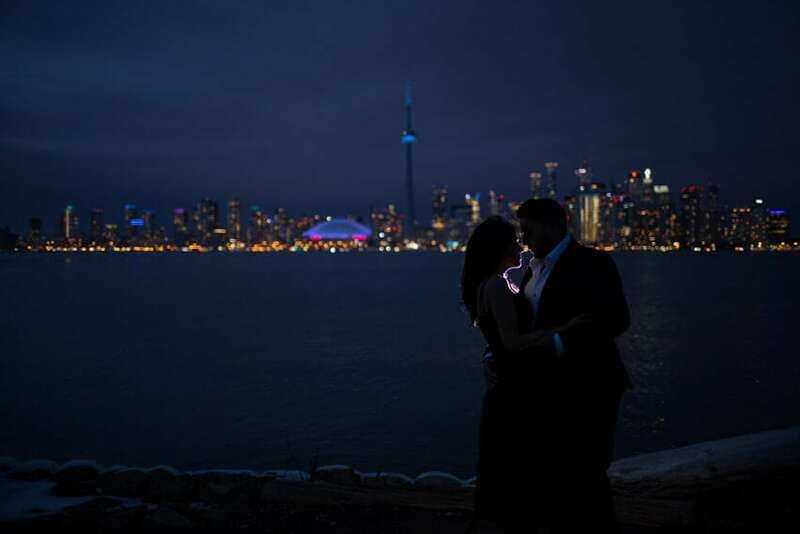 Three pointers to consider when planning Engagement shoot at Toronto Islands! The Canadian summers attracts tourists to the Islands, but in the winter it is quiet. If you are planning to visit during summers, avoid Centre Island during afternoon hours as it is flocked with tourists and residents out to enjoy the hot weather. Toronto Islands offer a wide variety of activities during the summers like bike riding, canoeing, frisbee golfing, playing volleyball, tennis and much more. During winters, the islands are deserted as restaurants and amusement parks are closed; alone on the island, it can feel as though, you own the place. In mid-October, the ferry service to the Islands dwindles; there’s no service to service to Centre Island yet a trip to Ward’s Island is continuous. Toronto Islands is a vast stretch of different islands. Check out the ferry schedule to make sure your not left stranded. Wait for the sun to go down to capture a perfect shot of the Toronto skyline. Skyline views can be enjoyed the most during winter season as it is not busy and you can photograph beautiful shots. Visiting the Toronto Islands is an incredible experience that gives you the best of both worlds – a serene natural environment without having to leave the city.